If you think vaping is benign, think again. 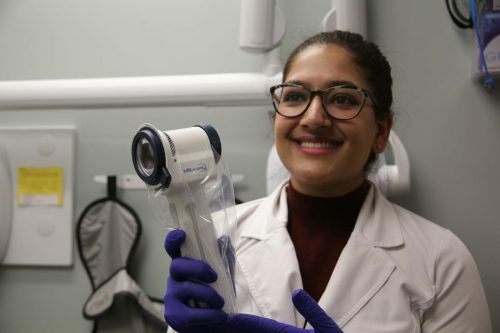 A USC study in 93 people shows that e-cigarette users develop some of the same cancer-related molecular changes in oral tissue as cigarette smokers, adding to the growing concern that e-cigarettes aren’t a harmless alternative to smoking. 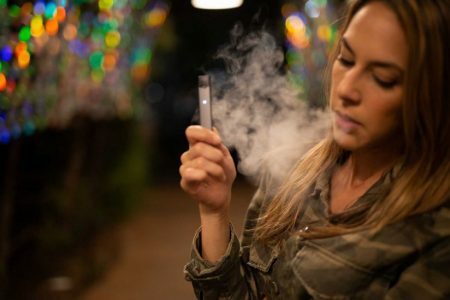 The research, published this week in the International Journal of Molecular Sciences, comes amid a mushrooming e-cigarette market and mounting public health worries. On a positive note, recent research found vaping is almost twice as effective as other nicotine replacement therapies in helping smokers quit. But among adolescents, vaping now surpasses smoking, and there’s evidence that e-cigarette use leads to nicotine addiction and future smoking in teens. Besaratinia emphasized that the molecular changes seen in the study aren’t cancer, or even pre-cancer, but rather an early warning of a process that could potentially lead to cancer if unchecked. The researchers looked at gene expression in oral cells collected from 42 e-cigarette users, 24 cigarette smokers and 27 people who didn’t smoke or vape. Gene expression is the process by which instructions in our DNA are converted into a functional product, such as a protein. Certain alterations in gene expression can lead to cancer. They focused on oral epithelial cells, which line the mouth. More than 90 percent of smoking-related cancers originate in epithelial tissue, and oral cancer is associated with tobacco use. Both smokers and vapers showed abnormal expression, or deregulation, in a large number of genes linked to cancer development. Twenty-six percent of the deregulated genes in e-cig users were identical to those found in smokers. Some deregulated genes found in e-cig users, but not in smokers, are nevertheless implicated in lung cancer, esophageal cancer, bladder cancer, ovarian cancer and leukemia. E-cigs and cancer: What’s next? Besaratinia and his team plan to replicate his findings in a larger group of subjects and explore the mechanisms that cause gene deregulation. He’s also launching another experiment in which smokers switch to e-cigs; he wants to see whether any changes in gene regulation occur after the switch. “For the most part, the participants are as curious as we are to know whether these products are safe,” he said. In addition to Besaratinia, the study’s other authors are first author Stella Tommasi, Andrew Caliri, Amanda Caceres, Debra Moreno, Meng Li, Yibu Chen and Kimberly Siegmund, all of USC. As we approach the holiday season I am reminded of the gifts of love we share with our families, as well as the New Year’s resolutions we make and try to keep after Jan. 1 history. I am a periodontist having practiced in Burlington and South Burlington for the past 40 years. In that time I have treated patients that have been severely compromised by tobacco. Some have lost teeth from advanced periodontal disease and some have lost parts of their tongue and jaw due to oral cancer, leaving them significantly compromised functionally as well as well as emotionally. I have had to advise teenagers and their families that their tobacco chewing habit had caused significant enough changes in their mouth to warrant a biopsy of the involved area. This caused great stress to them as they waited a week to find out the results. Some may think that it takes many years for tobacco use to compromise one’s health, but teenagers can die a horrible death from tobacco use if they are one of the unlucky ones who is genetically predisposed to oral cancer. Over the years, I have traveled throughout Vermont teaching about tobacco and nicotine addiction to elementary, junior and senior high school students. I feel that I have a good sense of what kids are thinking about these subjects. The elementary school students seem to understand that cigarettes are bad for them. When one talks to the middle school kids, there are some that are beginning to think that cigarettes and smokeless tobacco use is cool, and when speaking to high school students, there is a larger percentage of them that have begun to use a variety of these products, ranging from cigarettes and cigars, to hookahs, to a variety of e-cigarettes, with the newest product, Juul, going viral. This product has become so much of a problem local schools have sent letters to parents warning them of its sudden increase in usage . It is legal for anyone over 18 to purchase all of these tobacco and nicotine products. Here are some facts to chew on. About 95 percent of adult smokers begin smoking before they turn 21. Two-thirds of 10th grade students and nearly half of eighth grade students say it is easy to get cigarettes. More 18- and 19-year-olds using in high school means younger kids have daily contact with students who can legally purchase tobacco products. I am often told that when one reaches the age of 18 they are mature enough to vote, or join the military, so therefore they are mature enough to decide on using tobacco products. Tobacco use costs the military about $1.6 billion annually in lost productivity and health care expenses tied to respiratory problems, cardiovascular disease and slower healing, according to the Department of Defense data. That’s expected to climb to $19 billion during the next 10 years and result in 175,000 premature deaths. The Air Force bans tobacco in recreation facilities, and the Navy banned tobacco on all submarines. The Vermont National Guard also stated that they would abide by Tobacco 21 legislation if it passed, again citing readiness and fitness. An argument has been made that tobacco retailers’ businesses will be irreparably harmed if tobacco 21 is implemented. Studies show that its impact over the first 5-8 years will be between one quarter and one half of a percent. Vermont law does not allow the sale of alcohol to anyone under 21, and the new marijuana law passed last year also restricts its usage to those over 21. Given the proven health risks of tobacco use, why does the present law allow tobacco usage at age 18? It has been calculated that 10,000 kids now under 18 and alive in Vermont will ultimately die prematurely from the smoking habit they began in their teenage years. Six states have passed tobacco 21 legislation. This includes Massachusetts and Maine, with New York likely to join this group. Do we really want kids coming from our surrounding states coming here to get their cigarettes or e-cigarettes? Even Altria and R.J. Reynolds, two of the largest tobacco companies in the world have stated that the age of sale should be 21. So as we approach the new year I want to appeal to our representatives, to resolve to pass tobacco 21 in the 2019 legislative session, and remind them about how much suffering they can prevent. The decisions they make will have major consequences for generations to come. What a great resolution to keep. What a great holiday gift for us all. Note: This commentary is by Nevin Zablotsky, DMD, a retired periodontist who practiced in South Burlington and the Coalition for a Tobacco Free Vermont. The U.S. Food and Drug Administration will review a request from an Altria Group Inc. subsidiary that wants to make the claim that a smokeless tobacco product is less dangerous than cigarettes. U.S. Smokeless Tobacco Co. said Friday that the FDA has agreed to do a substantive review of its “modified risk” application for Copenhagen Snuff Fine Cut. The company submitted the request for review earlier this year. The FDA requires smokeless tobacco products to carry statements that warn about the risk of mouth cancer, gum disease, tooth loss and addiction and that the product is not a safe alternative to cigarettes. The warnings are to be randomly rotated on packaging. “We filed this application because we think adult smokers looking for potential reduced risk alternatives to cigarettes should have accurate information about the relative risks of Copenhagen Snuff,” Joe Murillo, Altria Client Services senior vice president for regulatory affairs, said in a statement. The FDA defines modified risk tobacco products as tobacco products that are sold or distributed for use to reduce harm or the risk of tobacco-related disease associated with commercially marketed tobacco products. In the review process, the FDA’s Tobacco Products Scientific Advisory Committee vets the scientific claims and makes a recommendation. The FDA has reviewed more than 30 modified risk applications from tobacco companies since 2011, but none has been approved. Some remain under review, while others were denied by the agency or withdrawn by the companies that submitted them. Patients with head and neck cancer caused by HPV respond very differently to treatments than those whose cancer is associated with the consumption of tobacco products. The first group generally has better outcomes, with almost 80 percent of patients surviving longer than 5 years after diagnosis, compared to only 45-50 percent for patients with tobacco-related cancers. To better understand what might cause these differences, a team of scientists led by Nevan J. Krogan, Ph.D., senior investigator at the Gladstone Institutes, is taking a unique approach by focusing on the cancer-causing virus. They recently mapped the interactions between all HPV proteins and human proteins for the first time. Their findings are published today in the journal Cancer Discovery. Krogan and Manon Eckhardt, Ph.D., a postdoctoral scholar in his laboratory at Gladstone, developed an integrated strategy to identify all the interactions between HPV proteins and human proteins. First, using a method called mass spectrometry, they discovered a total of 137 interactions between HPV and human proteins. Then, in collaboration with computational biologist Wei Zhang, Ph.D., in the laboratory of Trey Ideker, Ph.D., at UC San Diego School of Medicine, they looked at entire networks of each protein—rather than only individual proteins—to detect the most important players. They also compared their list of proteins with data from HPV-associated cancer samples published by The Cancer Genome Atlas project. This large consortium catalogued genetic mutations in tumors of various cancers. Krogan and his collaborators have shown that integrating HPV-human interaction with tumor genome data, and focusing on genes that are mutated in HPV-negative but not HPV-positive tumors, constitutes a powerful approach to identify proteins that serve as both viral targets and genetic drivers of cancer. Researchers say vaping could lead to an increased risk of developing mouth cancer. A study carried out by the American Chemical Society found evidence to suggest using e-cigarettes raises the level of DNA-damaging compounds in the mouth. If cells in the body are unable to repair the DNA damage after vaping, the risk of cancer can increase, the study claims. Since they were introduced in 2004, e-cigarettes have been marketed as a safer alternative to smoking. But the team carrying out the study claim genetic material in the oral cells of people who vape could be altered by toxic chemicals. E-cigarettes work by heating a liquid – which usually contains nicotine – into an aerosol that the user inhales. It is often flavoured to taste like fruit, chocolate or bubblegum. 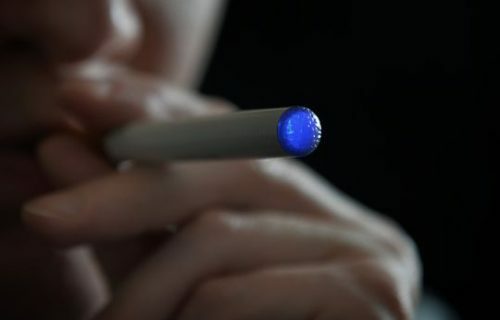 ‘It’s clear that more carcinogens arise from the combustion of tobacco in regular cigarettes than from the vapor of e-cigarettes,’ Silvia Balbo, the project’s lead investigator said. ‘However, we don’t really know the impact of inhaling the combination of compounds produced by this device. ‘Just because the threats are different doesn’t mean that e-cigarettes are completely safe.’ The latest study, due to be presented at a meeting of the American Chemical Society this week, analysed the saliva and mouth cells of five e-cigarette users before and after a 15-minute vaping session. Researchers found levels of the toxic chemicals formaldehyde, acrolein and methylglyoxal had increased after vaping. Now they plan to follow up on the preliminary study with a larger one involving more e-cigarette users. They also want to see how the level of toxic chemicals differs between e-cigarette users and regular cigarette smokers. When it comes to the health risks associated with smoking, most people know about lung cancer and heart disease. But less than a third of Australians realise it can also cause conditions such as acute leukaemia and rheumatoid arthritis, according to a new study, raising the question around whether current graphic cigarette warning labels need to be refreshed. The study, published in the Medical Journal of Australia, asked 1,800 Australians about whether they thought smoking increased the risk of 23 conditions shown to be associated with tobacco use, such as lung cancer, stroke and diabetes. While more than eight in 10 participants knew lung, throat and mouth cancers, heart disease and emphysema were linked to smoking, much fewer were aware it was associated with erectile dysfunction, female infertility, diabetes and liver cancer. The results showed the current warning labels were doing their job, and that it might be time to expand them, said Michelle Scollo from Cancer Council Victoria, which ran the study. “It was predictable and pleasing that smokers knew about the health effects that have been highlighted in the current sets of warnings and media campaigns,” Dr Scollo said. “[But] fewer than half realised it could reduce your fertility, and that could have a really major impact on the course of people’s lives … There’s a lot that people need to appreciate. Part of the reason the link between smoking and some of the conditions surveyed aren’t well known is because research into the health effects of tobacco use has advanced since the time the current warnings were developed, Dr Scollo said. The current set of graphic warning labels have been in place since 2012. “In 2014, the US Surgeon-General released a 50-year report — they released a whole updated statement of the diseases caused by smoking. Many more conditions were added to the list in 2014,” she said. Dr Scollo hoped the research would lead to an expanded campaign including new graphic warning labels, showing more of smoking’s health risks. “People need continuous reminders of these sort of things if they’re going to remember them but I don’t see why we need to be limited to just 14 warnings,” she said. 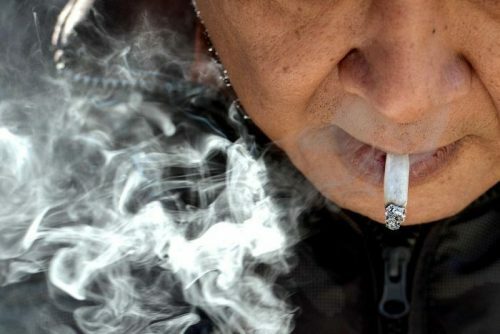 There is value in looking at people’s awareness of smoking’s risks, according to Australian National University anthropologist Simone Dennis, who researched the effects of the original graphic warning label campaign. But she cautioned against automatically reaching for more graphic warning labels as the solution. Health warnings about smoking were usually framed around a “particular middle-class version of health” and the assumption that more knowledge will change people’s behaviour, said Professor Dennis, who was not involved in the most recent study. She said the original graphic warnings were effective in reducing smoking, especially among white, middle-class people, but doubted refreshing the campaign would see a similar reduction. “I don’t know that the constant articulation of danger is doing anything for the people who are smoking,” she said. The danger, Professor Dennis said, was that people whose behaviour wasn’t changed by the warning labels tended to be from marginalised groups, and pushing the same line risked marginalising them further. “If you’re marginalised already, that’s a really heavy burden to bear because you’ve done something that’s perceived to be extraordinarily dangerous,” she said.